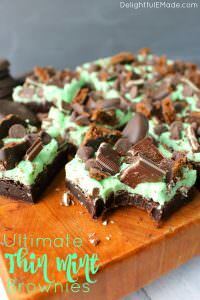 If you like chocolate and mint, you’ll LOVE these! 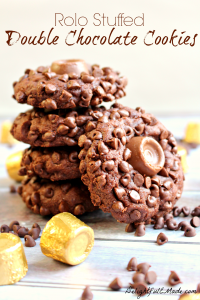 These chocolate mint cookies are super soft and fudgy, stuffed with a mint truffle chocolate, and are topped with mini chocolate chips. 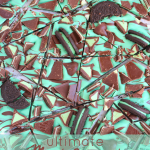 The ultimate mint chocolate treat! 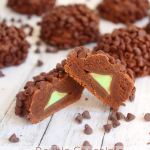 Since he wanted something “chocolate and mint” to celebrate with his class at school, I decided to whip of a batch of these super-chocolaty, super-minty chocolate mint cookies! 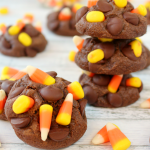 These cookies are not only my son’s favorite, but pretty much everyone (even my husband who really isn’t that big of a mint fan!) devoured these sweet treats! 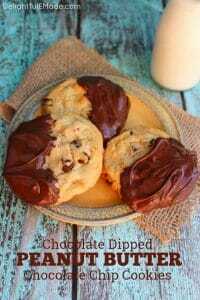 The dough for these cookies stays ultra moist as it has a butter and cream cheese base. 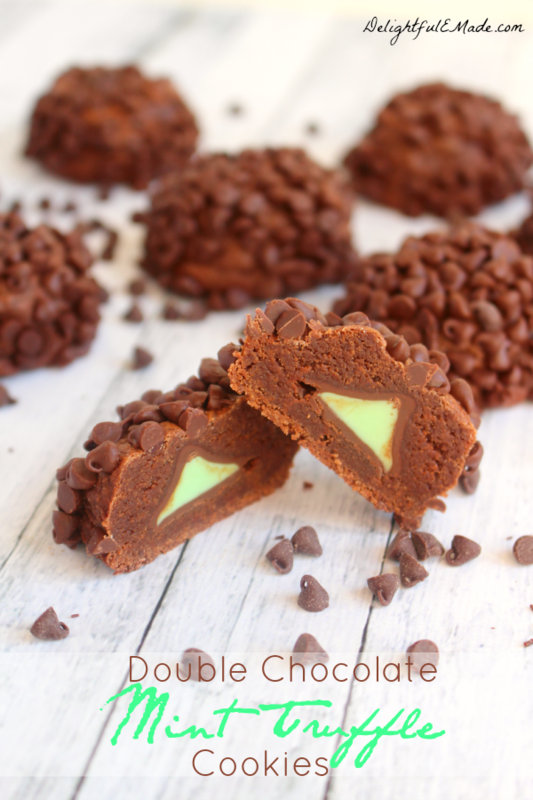 For the mint truffle chocolate that’s hidden inside, I used winter mint truffle Hershey’s kisses. I believe these are a seasonal product made by Hershey’s – if you can’t find these on the shelf, I would recommend regular Hershey’s kisses or another mint chocolate. 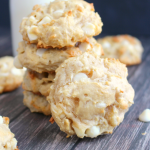 To create these cookies, you’ll start with about a teaspoon of dough on the bottom. You’ll then create a dimple with your thumb where you place the chocolate truffle. Then add a tablespoon sized amount of dough on top of the truffle and seal it together. I found it helpful to keep the flat side in the palm of my hand so you know where the bottom is. When the cookie is fully sealed, roll the top part of the cookie into the mini chips, and place on your baking sheet. 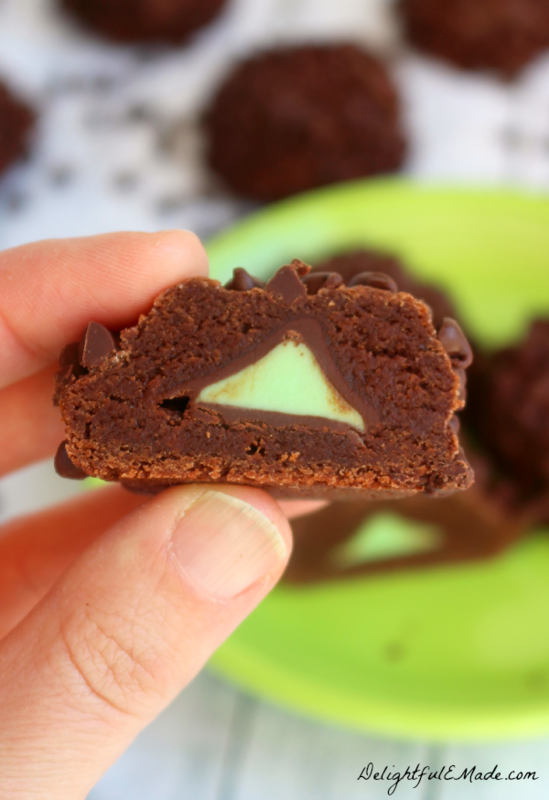 If you like chocolate and mint, you'll LOVE these! 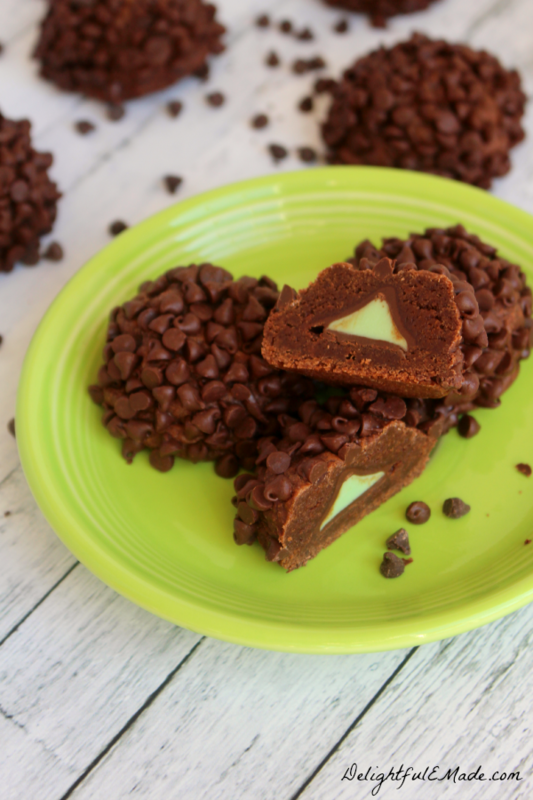 Super soft, fudgy cookies surround a mint truffle chocolate, and are topped with mini chocolate chips. With a hand or stand mixer, cream together the butter and cream cheese. Add the sugar and cream together until fluffy. Add the eggs and peppermint extract and mix until combined. In a separate bowl sift together the flour, cocoa powder, salt and baking powder. Gradually add the dry ingredient mixture to the wet. Mix together until fully combined. Dough will be slightly stiff - you may have to mix the last of the dry ingredients by hand, and it may be too thick for the mixer. 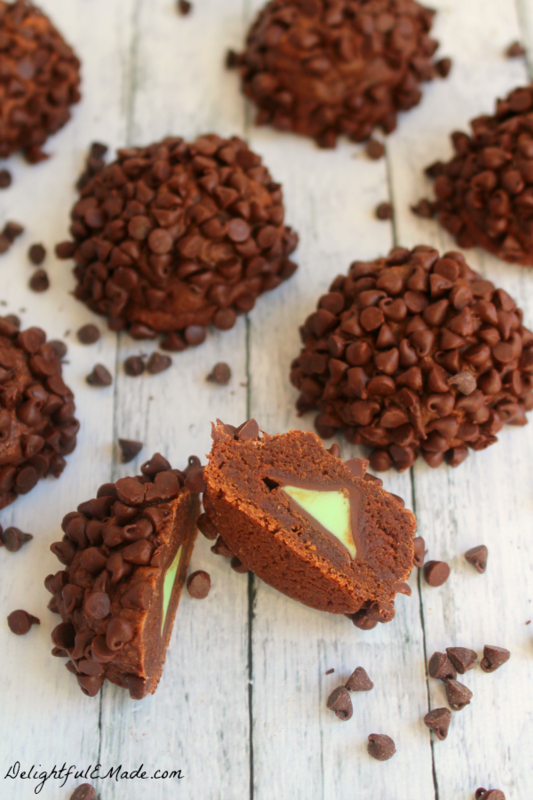 Add the mini chocolate chips to a bowl, and unwrap the mint chocolate truffles. 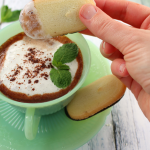 In your hands, place a teaspoon sized amount of dough in your hand and shape it to the size of a quarter, placing a small dimple in the middle of the dough with your thumb, where you'll add a chocolate truffle. Then place a Tablespoon sized amount of dough on top of the truffle and seal it to the bottom piece of dough. Cookies will be about the size of a golf ball. Roll the top portion of the cookie into the mini chips. Place the cookies on the baking sheets at bake at 350 for 10-12 minutes. Cool on the baking sheet for about 5 minutes before transferring to a cooling rack to cool completely. Store the cookies at room temperature in an airtight container. 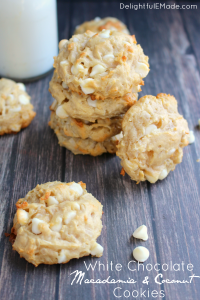 With just a few steps, you’ll have an amazing batch of cookies. The cookies are great warm out of the oven, and even better cool. 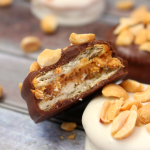 When completely cool you’re able to see the mint chocolate in the middle – a nice minty little surprise! Oh, my! These look like chocolate heaven!Thanks for sharing at DIDI. 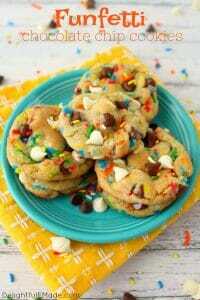 They look so tempting! Love them. pinned! 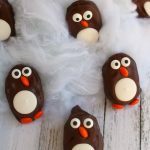 Thanks for joining the Family joy blog link up party! Sounds great and they looks really pretty! Thanks for sharing on the What's for Dinner link up! These look just as yummy as they did the first time I saw them! Thanks for sharing at the What's for Dinner party! This Friday (December 1) we start the great cookie exchange on our blog. Would love to have you add these!